For the speed skater, see Harry Smyth. 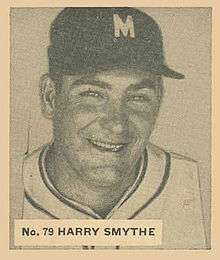 William Henry Smythe (October 24, 1904 in Augusta, Georgia – August 28, 1980) was a pitcher in Major League Baseball. He pitched from 1929 to 1934. He later managed the Montreal Royals in the International League for part of the 1936 season.